So after trying to lead you into temptation at the start of the week with my Nutty Apple Loaf post, I thought it was only fair to post something a little healthier this time round. Ok, so we’re not talking mega-healthy, but definitely a step in the right direction. 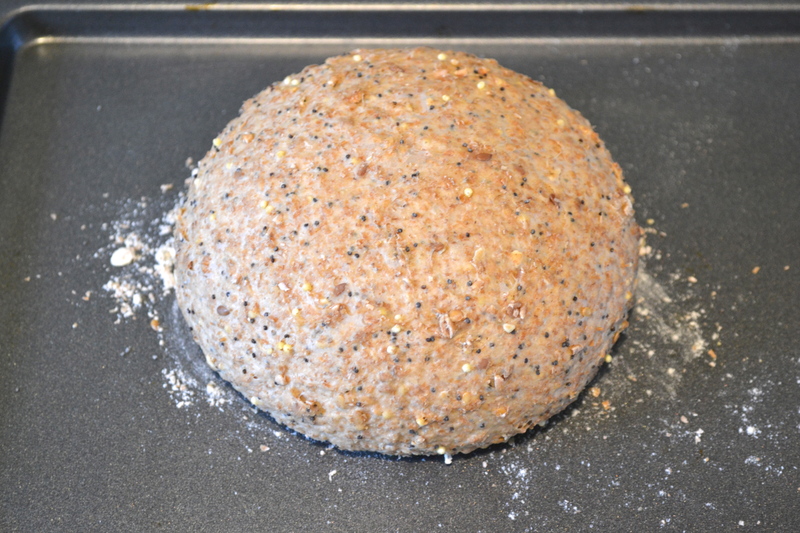 Seeded wholemeal bread. Nutritious and delicious and perfect for dunking in warming soups during these stormy times. It’s fair to say that my early attempts at making wholemeal bread were not a success. The resulting loaves were generally only suitable for use as doorstops they were so heavy and dense! In my defence though, wholemeal flour does tend to be trickier to work with than white when making bread. You need to add more water than you would with a white loaf, knead it for longer as the flour has a lower gluten content (which is why my early attempts resulted in heavy, horrid loaves), and it also needs longer to rise due to this heaviness (well, in my experience anyway). But like anything, once you’ve made it a couple of times, it’s just as easy as white bread. And this is especially true after you discover the wonderous product that is the seeded wholemeal bread mix from Waitrose! 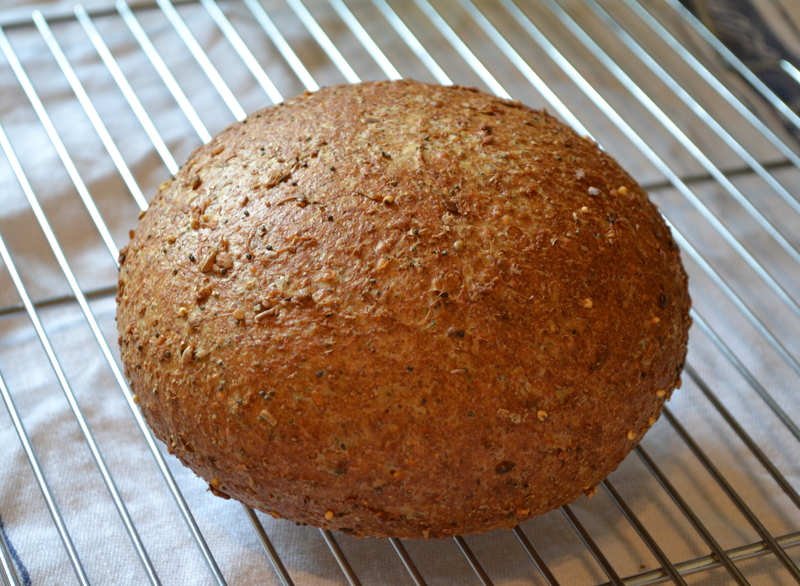 It produces the most delicious wholemeal bread that I have ever managed to bake. I’m not totally sure what the magic ingredient is, but suspect it’s the combination of malted barley flour with wholemeal flour with extra wheat gluten added to the flour. It’s also got something to do with the perfect ration of seeds and oats in the mix. The other great discovery I made whilst following the recipe on the side of the packet (ahem…), is that by rubbing a small amount of butter into the flour before adding the rest of the ingredients, your finished loaf will be lighter and tastier. Another tip (this one not from the bread packet!) is to heat your oven as high as possible, put the bread in, chuck a mugful of cold water into the bottom of the oven, then turn the oven down to the required temperature. This results in a delicious, crispy crust. Perfect for soup dunking or slathering in butter and marmalade in the morning. Mmm. So for those of you who don’t live near a Waitrose or shudder at the thought of pre-mixed bread flour, I’ve just looked up what’s inside the mix. 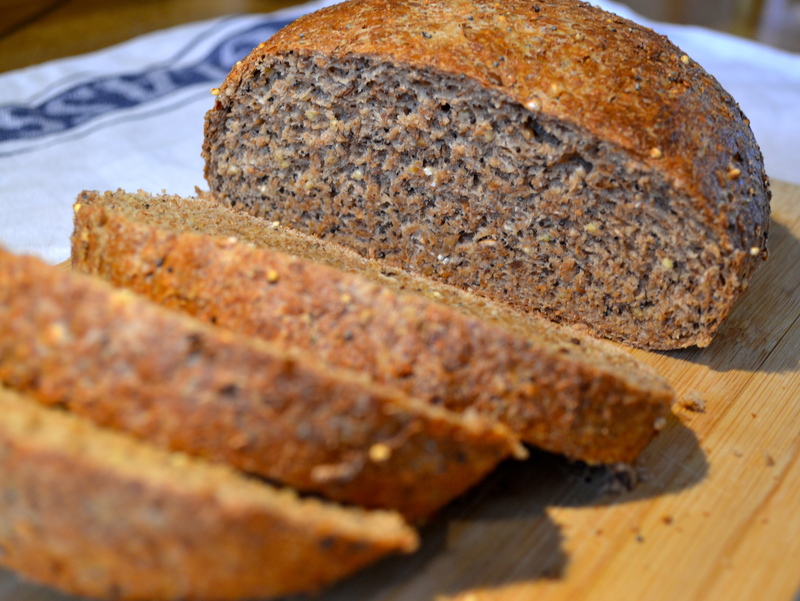 Wholemeal wheat flour, mixed seeds (11.5%) comprising millet seeds, poppy seeds, golden linseeds, and brown linseeds, cracked wheat, oats, malted barley flour, and wheat gluten. 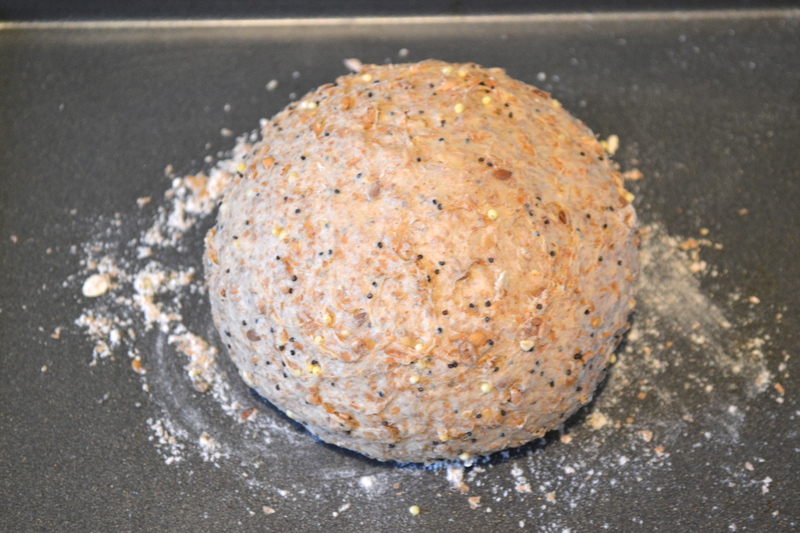 So you could easily just use wholemeal flour with some seeds and oats mixed in if you felt so inclined. Either way, this is definitely one to try! Recipe from the Waitrose bread packet! 1. 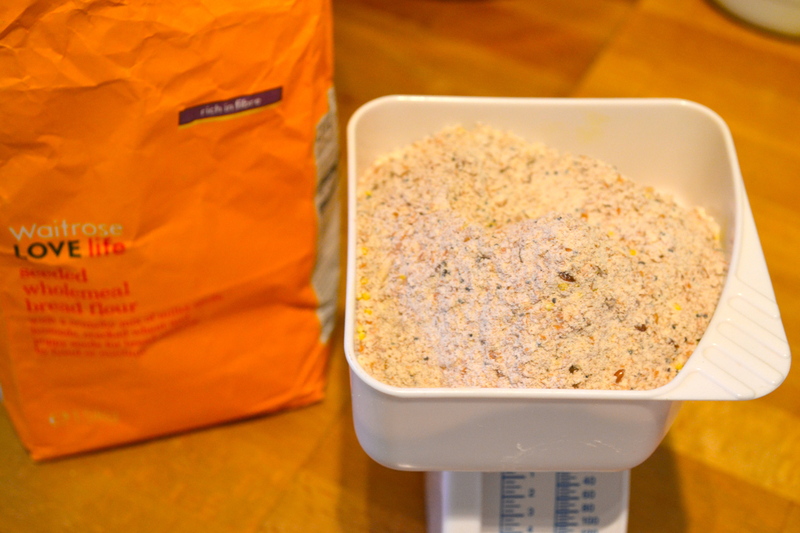 Place the flour into a large bowl and using the tips of your fingers, rub the butter into the flour until it resembles breadcrumbs. 2. Add the yeast and salt to the flour (add to either side of the bowl), make a well in the centre and add the water. You can either use a stand mixer with a dough hook attached to knead the dough for 5-8 minutes until it is stretchy and smooth, or do so by hand on a lightly floured or oiled surface. It takes me about 15 minutes but if you’re stronger/have bigger hands it will probably only take you 10. Make sure your dough is wet enough. I find it usually needs a splash more water than the 300ml specified. It shouldn’t be dry, but neither should it bind your hands in a sticky mess when you knead it. The wetter your dough (up to a point! ), the better the bread. 3. Cover the dough and leave to double in size. This can take anything from 1-3 hours depending on how warm your kitchen is – mine took 1.5 hours. 4. Once risen, knock back the dough by folding the dough in on itself repeatedly. Either form into a round/other shape (tucking it in on itself to make sure it’s nice and compact) and place on a lightly oiled baking tray or in a lightly oiled 900g loaf tin. Cover and leave to rise again until doubled in size and it springs back quickly if you prod it with your finger (it will take 1-1.5 hours). 5. Preheat the oven to 230°c/210°c fan/450°f/gas mark 8. Put your loaf in the oven and thrown in a mugful of cold water to the bottom of the oven to create a steamy atmosphere for your dough as it cooks, which will give you a crispy crust. 6. Cook for 25-30 minutes until golden and cooked through. You can check if it’s cooked by tapping the bottom of your loaf – it should sound hollow. If in doubt, give it a few more minutes to make sure. 7. Leave to cool fully on a wire rack before tucking in. PS: the loaf in my photos is half a portion so yours will be double that size if using the above recipe.